Over the past 24 hours, strategy game Total War: Rome II has picked up over 350 new negative reviews, triggering Steam’s graph-based review bomb alert system. The reason? A controversy surrounding women generals that appears to be largely contrived. It began last month with a handful of Steam forum posts and reviews in which players claimed that recent updates had increased the frequency with which women generals showed up as candidates for their armies. One went so far as to insist that “over 50 percent” of their generals were women and offered a screenshot as proof. In response to sentiments like these and a discussion that spiraled out of control on Rome II’s Steam forums, community content editor Ella McConnell said probability of getting a woman general comes down to luck of the draw, and that if these people weren’t OK with that, there are mods they can use to remove women entirely—or they can just play something else. “Total War games are historically authentic, not historically accurate,” she wrote in August. “If having female units upsets you that much you can either mod them out or just not play. 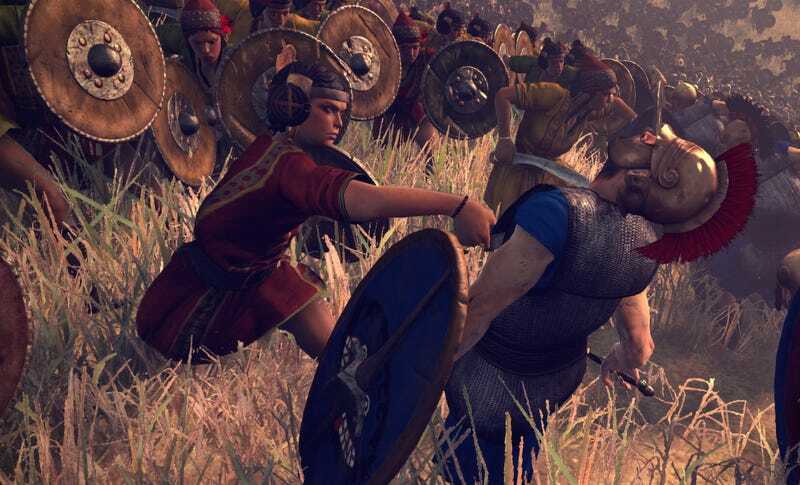 People saying they won’t buy the game because there are too many women in it is fine with us—if that’s their reason, we’d rather they didn’t anyway.” In subsequent responses to similar threads, she clarified that other elements of the Total War games are also not 100 percent historically accurate, and that she’s not trying to push an agenda, but rather conveying how Creative Assembly feels about its own game series. “I’m not HR, nor is it my job to push a ‘personal agenda,’” she wrote earlier this month. “I convey the views of the company, which is where the statement regarding historical authenticity vs. historical accuracy (and the inclusion of women) originates.” She is, however, fighting an uphill battle, having only recently been brought in to moderate a forum on a platform that’s been largely unmoderated for most of its existence. “0/10, would not check my privilege again,” reads another. The twist here is that many of these people’s fears appear to be unfounded. Others rant and rave about “CULTURAL MARXISM” and call for boycotts. It’s a grand old time, in other words. Elsewhere, on Rome II’s Steam forums, people are calling for McConnell’s firing, even though she said she was just relaying a message from on high. It’s reminiscent of the way a vocal contingent of Guild Wars 2's community went after narrative designers Jessica Price and Peter Fries, or the pile-on that recently saw systems designer Daniel Klein and communications associate Mattias Lehman leave Riot in the wake of controversy surrounding a PAX panel focused on women and non-binary people. While the circumstances are different, the broader idea is the same: game developers didn’t spoon-feed a handful of players exactly what they wanted to hear, and now that their precious faberge skin has been cracked, they want blood. And of course, at the heart of it all lies a person in a position of influence—in this particular case, a woman—talking about women. Naturally, people rallying around Rome II are employing the same sorts of tactics and rhetorical tricks that worked for other roving bands of enraged culture warriors because, well, they worked. People got fired. The twist here is that many of these people’s fears appear to be unfounded. In response to this brewing brouhaha, some players decided to dig around in Rome II’s database. YouTuber RepublicOfPlay posted a video of his findings, pointing out that only certain cultures—Romans not among them—can even have women generals, and there’s a 65 percent chance characters will be born male, and only a 35 percent chance they’ll be female. That means in-game birth rates are historically inaccurate in favor of men. RepublicOfPlay ran some numbers and came to the conclusion that your chances of getting a woman general is about one in ten in most cultures—except the Kush faction, which boosts women’s probability to reflect actual history. Regardless, women generals then get dropped into a selection pool which is populated mostly by men. As of publishing, Creative Assembly had yet to respond to an inquiry for comment on the situation, nor had it spoken about it publicly on social media. For now, some Rome II players continue to rage. “There have been no changes to recruitable female general spawn rates. But with the addition of the family tree feature and the new gameplay options it brings, playable factions may gain more female family members via marriage. If a player has their male family members seek a wife and get married, more females enter the family. This means more female characters may appear as recruitable generals, but again, only in those factions where female characters may be recruited as generals. Female characters appear throughout the game, but have between a 10 and 15% chance of appearing as recruitable generals for some of the playable factions. The exceptions are the Greek states, Rome, Carthage and some Eastern factions, which have a 0% chance, and Kush, which has a 50% chance. This is to broadly represent the cultural differences in those factions during the time the game is set. These percentage chances are moddable by players. We’ve not seen a verifiable bug where this is shown to be different or not working as intended.